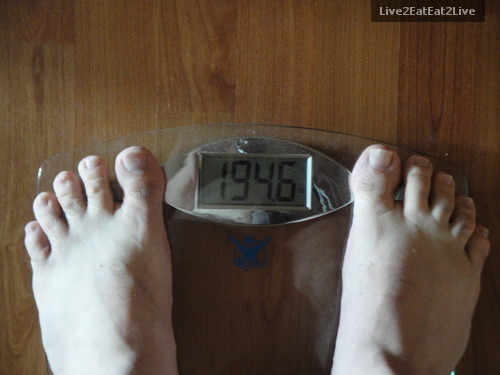 The picture was taken this morning. We’ll be attending some eating events over the weekend. Sometimes a break from the routine and a treat provides even more motivation. 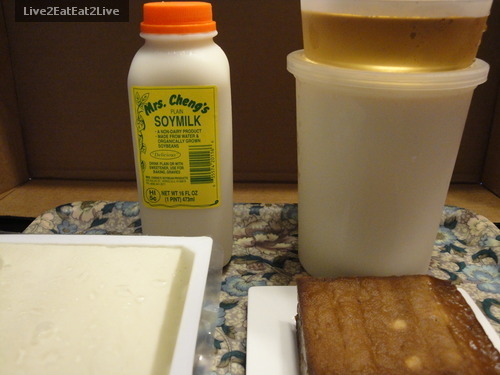 We knew about Mrs. Cheng’s making fresh soybean (tofu) products but its location was always out-of-the-way. 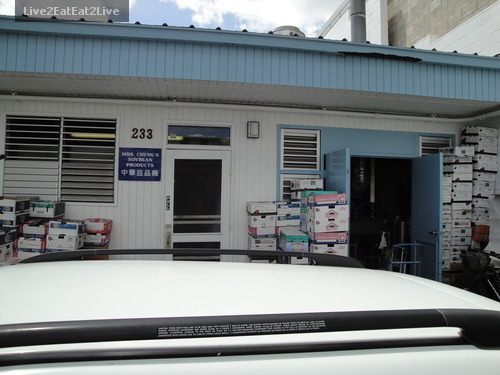 I think the last time I visited the factory, they were in Palolo (the factory has since moved to the Kalihi area). The other day, I was in the Kalihi area and decided to look for the factory again. After a couple of wrong turns I found the factory. The building is set back from the street with parking in the front. 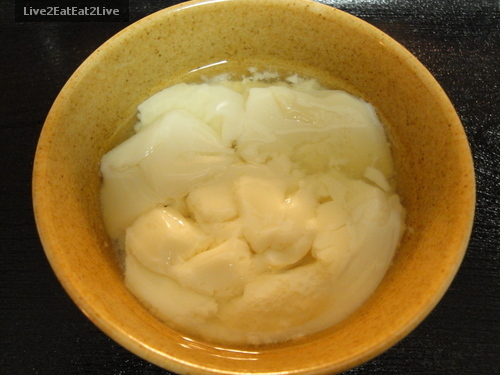 Right back = doufu hua (tofu flower) or tofu pudding with syrup. After taking the soft doufu out of its packaging, I rinsed and cubed. I topped the doufu block with grated ginger, katsuobushi (dried shaved tuna flakes), green onions, and ground black sesame seeds. The Cat ate her soft doufu with sesame oil and shoyu (the blocks on the left are The Cat’s, with no green onions). I used a combination of wasabi oil (previously posted), and shoyu. The Cat used the soymilk for her morning cereal. Because the soymilk was unsweetened, she said there was too much of a bean flavor that didn’t quite go with the cereal. She said it would taste better as a drink. The doufu gan is slightly dried and marinated (I think Chinese five spice is included in the marinade). 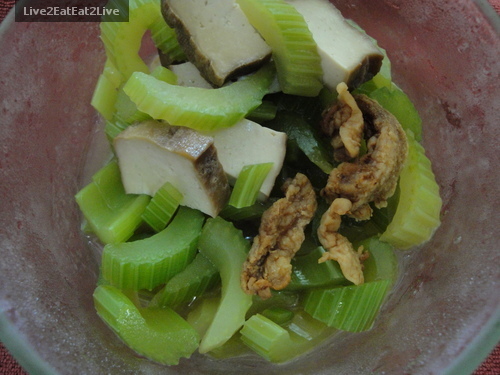 I sliced the doufu and stir fried it with celery. The Cat said that this combination is a classic Shanghainese dish. I had a few bits of pork cracklings leftover which I threw on top. 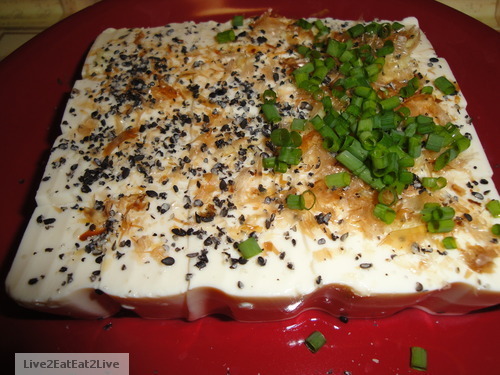 The doufu hua (tofu pudding) is extremely soft and eaten for dessert. The syrup is added to taste to sweeten it. The syup that was included tasted like diluted maple syrup. One restaurant in Chinatown serves the doufu hua with ginger infused simple syrup. I think I may try to make the ginger syrup next time we buy this. It was good to rediscover these ingredients and the factory again. Thanks P & B.
Here’s the link to a write-up about Mrs. Cheng’s: http://www.hawaiiangrowntv.com/content/mrs-chengs-tofu-mrs-chengs-tofu-factory. Here’s a link to the location of the factory: http://maps.google.com/maps?hl=en&q=mrs+cheng’s+soybean+product&ie=UTF8&hq=mrs+cheng’s+soybean+product&hnear=&ll=21.325198,-157.905464&spn=0.128566,0.22007&z=12&iwloc=A. Eating to live. The Cat has been urging me to eat more carrots and tomatoes for the lutein and lycopene. As much as possible, we not to take supplements. 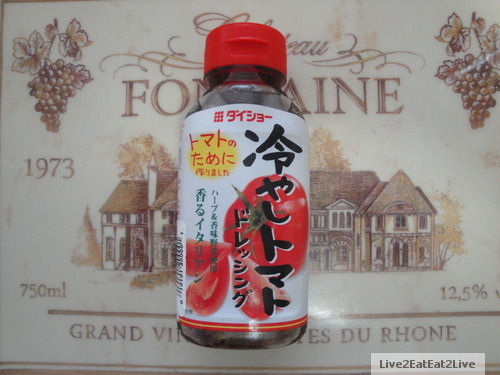 At the Japanese market the other day, there was this bottle of tomato dressing at the clearance section. The label on the bottle said “daisho” hiyashi. A search on the internet provided about the two swords that samurai carry and a cold noodle dish. I’m not quite sure how it relates to tomato dressing. I really like grape tomatoes. I find they have more tomato flavor, plus I like the way they crunch. 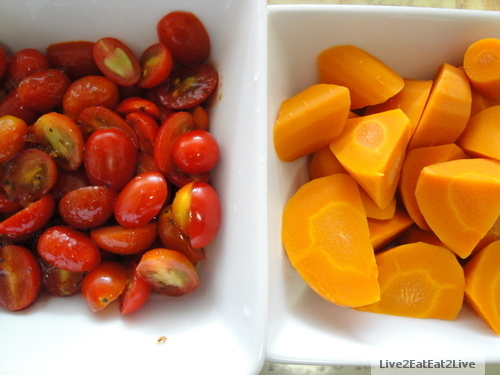 The carrots were steamed, without added oil or salt. The dressing on the tomatoes provided enough seasoning and fat for the two vegetables. 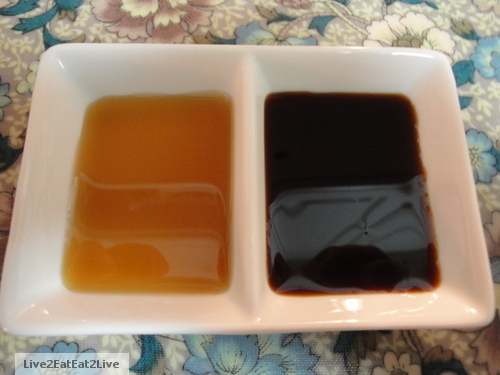 The dressing was dark and liquid, it reminded me of bottled balsamic vinegar dressings. One of the ingredients was millet jelly, the consistency was thicker than the bottled balsamic vinegar dressings. The dressing was not as tart as balsamic vinegar dressings. It was also a little sweeter than the bottled balsamic vinegar dressings. All in all, I liked it. Eating to live can be enjoyable. The Cat heard about a tonic, shou wu, that’s supposed to prevent gray hairs or return white hair to its normal color. One of our friends, whom we haven’t seen for a long time used to have a lot of white hair. When we saw her recently, most, if not all of her hair had returned to its dark color. Her mother has been preparing shou wu tonic for her to drink daily. The last time we visited Shanghai, The Cat bought a package of shou wu to try. When she asked for shou wu, the clerk said it’s called he shou wu, we’re not sure why. At first, The Cat was pouring hot water over the nuggets (we assumed it was like making tea). However, our friend’s mother said that the nuggets have to simmer for several hours to be effective. In typical Chinese herbal tonic fashion, I use double the amount of water to make one cup of liquid. After simmering, the liquid reduces to a little more than the one cup. The tonic is not much to look at, a brownish liquid that looks like someone stirred some dirt into water. The tonic smells kind of earthy. The Cat said the tonic has no taste. 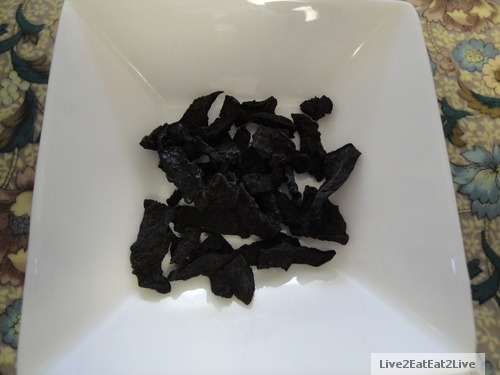 Here’s a website that discusses the benefits of shou wu in more detail: http://www.naturalnews.com/026786_He_Shou_Wu_longevity_medicine.html. In my pre-blog days, I tried a stir-fried spicy cucumber recipe I found on the internet. It was a fail. It wasn’t the recipe’s fault. I didn’t care how soft the cucumber turned out (personal preference). The Cat was also not thrilled with the outcome. She is more familiar with smashed cucumber (see whacked cucumber post). What I did like about the stir-fried cucumber was how the oil and flavors coated the cooked cucumber better than the raw cucumber. I used this recipe as a starting point: http://appetiteforchina.com/recipes/pork-and-cucumber-stir-fry. For this variation, I focused on the cucumber and seasonings. I wanted to coat the cucumber slices with all the flavors. I used ground ginger and garlic powder instead of fresh. I used sea salt instead of rice wine and shoyu, I wanted to keep the dish on the drier side. I added chili powder. I stir fried the cucumber for about a minute to maintain its crunch. 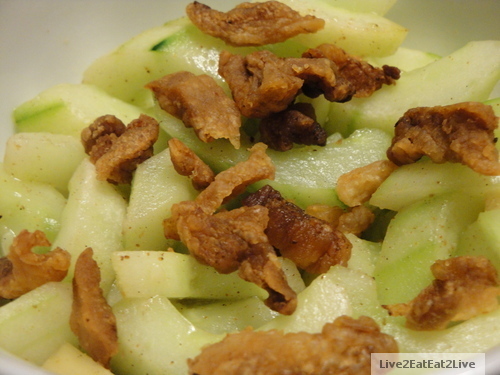 Instead of pork, I topped the cucumber slices with crackling I had from rendering pork fat. 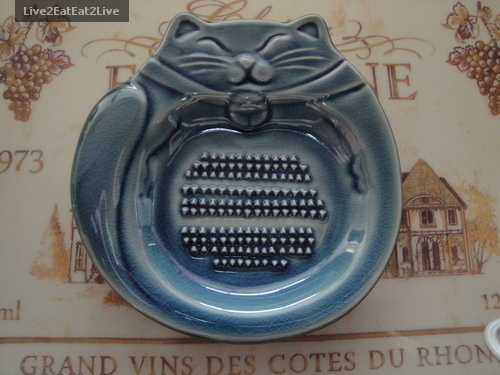 The Cat liked the dish. It was still crunchy enough for her and a little different from her smashed cucumbers. This was more of glazing cucumber slices instead of stir frying. It works for us.